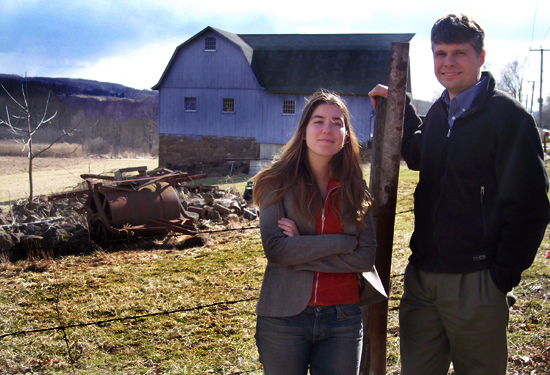 Jessica Pfund, ’05 and Phillip Resor, assistant professor of earth and environmental sciences, observe one of Middletown’s few remaining agricultural sites. It started out with little more than an idea, some old aerial photos and a handmade map. Several months and a lot of hard work by three dedicated people later the result may provide a whole new way to evaluate and influence the look and growth of towns in Middlesex County for years to come. Not bad considering it all started out as a question from an inquisitive undergraduate. The undergraduate, earth and environmental sciences major Jessica T. Pfund `05, was a student Earth and Environmental Science 322: Introduction to GIS (Geographical Information Systems), in the spring of 2004. The classs instructor, Phillip Resor, assistant professor of earth and environmental sciences, had brought in a guest speaker, Sandy Prisloe, a geospatial extension specialist from the University of Connecticuts Center for Land-use Education and Research (CLEAR). Prisloes presentation included a discussion of how satellite data were being used to quantitatively measure changes in Connecticuts landscape and to infer the impacts of these changes on the quality of life and the environment. Pfund was intrigued, and she was looking for a possible research project. After discussing the idea further with Resor, Pfund decided: this would be her project. Aided by a $2,500 grant from the Middlesex County Community Foundation and additional support from the Mellon Foundation and The University of Connecticut, Jessica, who was responsible for the bulk of the data collection, got to work. Much of this was linked to the differences in how the information being examined was generated. The images from the 1970 study were based on a hand-made mylar map that was in turn based on aerial photographs of the county. The information this would be contracted with was generated by images derived from satellite images of the same area in 2002. There were some other challenges too. For instance, the old maps identified the land as: active agricultural, inactive agricultural or nonagricultural. GIS images provided more than a dozen different characterizations, including assessments of soil viability for agricultural use and disposition of wetlands. Translating the GIS data also had some interpretive challenges that were produced because of how things have been done in the state over the years. Currently there is still a substantial amount of data to crunch and quantify, but Resor and Pfund anticipate having the study done sometime in the spring. They will publish a report with Prisloe detailing their findings. There will be public presentations and discussions of the data at town meetings in Middlesex County. The towns can then use the data to better plan new housing and business construction. However, the study has already generated a result that will be producing more benefits for the county. Resor received a service-learning grant from Wesleyan to expand his efforts in these types of studies. 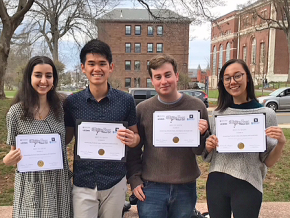 This spring, his students are working on similar projects for The Nature Conservancy, The Connecticut River Costal Conservation Commission, The Middlesex Land Trust and the Town of Portland. 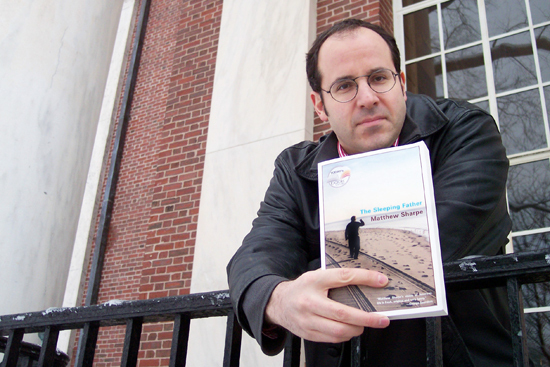 Matthew Sharpe, assistant professor of English, is the author of “The Sleeping Father,” which will be part of Norwalk’s “One Book, One Community” celebration. When writing “The Sleeping Father,” Sharpe wanted to understand the enormous change in American mental healthcare, which he says now relies much more heavily on psychopharmaceuticals than it did even ten years ago. 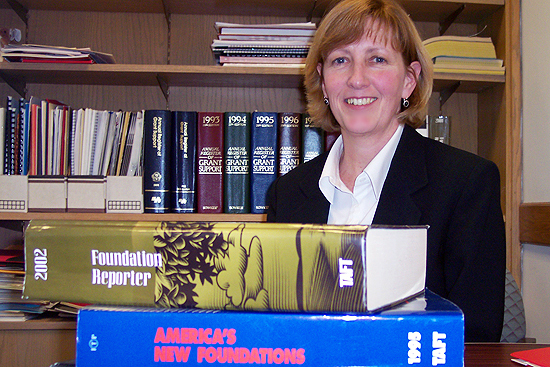 Sharpe adds that a The New York Times report indicated 120 million Americans took antidepressants in 2002. “I know a lot of people who have been substantially helped by antidepressants, and even therapist friends of mine who favor the talking cure say some of their patients are too depressed to talk without the pills,” Sharpe says. “But still, if half the country’s taking them, I think we can safely say they’re over prescribed.” Characters in “The Sleeping Father” have a comic bent, but Sharpe says they are decidedly realistic. “The book is always humane,” he says. 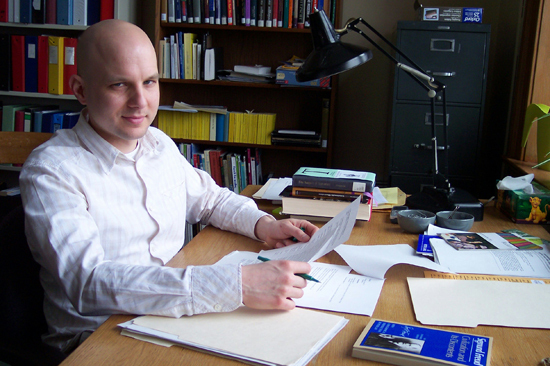 “The characters may sometimes behave like figures out of a comic book or a laugh-track sitcom, but they are fully developed and elicit caring not just amusement.” Sharpe, who joined the English Department last September, said some of his most profound influences have not been writers but people working in other fields. James Ensor, Julius Hemphill, Marlon Brando, and Violeta Parra, among others, have inspired him. Sharpe wrote his first story when he was 10 years old about a bulldog who was a construction worker. “It was hard to write that first story and it’s been hard to write every story since then,” he says. “So why do I still do this? 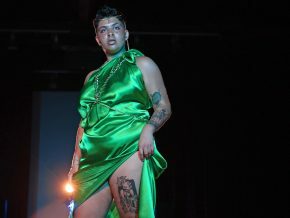 Because the career as an international supermodel didn’t pan out.” Sharpe will also make a presentation about “The Sleeping Father” during a luncheon at the Norwalk “Festival of Words” on April 9 at Norwalk Community College. Sharpe’s first book, “Stories from the Tube” is a collection of 10 short stories based on TV advertisements. His first novel, “Nothing is Terrible,” is loosely based on “Jane Eyre” and set in the late 20th century in New York City. Ulrich Plass studies German literature and continental philosophy with an emphasis on aesthetics. Plass is currently revising his dissertation for publication. It focuses on philosophical interpretations of literature within the social and cultural context of post-war Western Germany. Plass’s academic work encompasses German literature from Goethe to the present, as well as continental philosophy with an emphasis on aesthetics. He is currently collaborating with friends on developing a conference about the intersections of popular culture and intellectualism in the works of the writer Rainald Goetz. In the next few years, he plans to work on 19th century poetry. Prior to coming to Wesleyan, Plass met people who spoke highly about the university. Plass lives close to campus with his significant other. 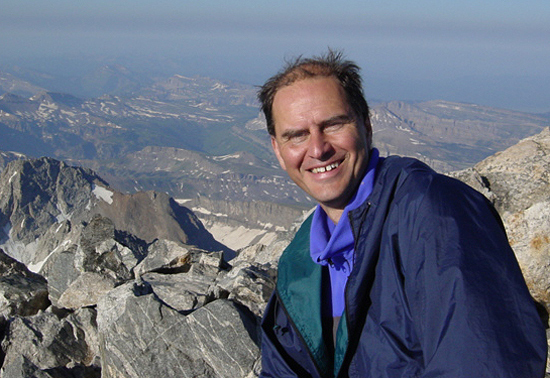 Ronald Kuivila, ’77, adjunct professor of music, smiles from the Grand Teton in Wyoming. Q: When did you join the Music Department at Wesleyan? A: I joined the department as an artist in residence in the early 80s and converted to adjunct associate professor in the early 90s. As an artist in residence, I was expected to teach three courses a year and maintain an active professional profile as an artist and composer. As an adjunct professor, I am expected to teach four courses a year, participate in committee work, and maintain an active professional profile. Most of the adjunct faculty in the Music Department began as artists in residence. Q: What do you consider yourself, musically, to be an expert on? A: Live electronics, computer music systems, sound installation and American experimental music. I am also a mediocre pianist. Q: Can you tell me a bit about your educational background and what led you into teaching music? A: I was a Wesleyan undergraduate and I came to Wesleyan with an interest in experimental music. In fact, it was a video tape of Nam June Paik’s that featured Alvin Lucier that led me to apply to Wesleyan in the first place. After Wesleyan, I studied at Mills College, worked as a recorded engineer and was an artist in residence at Media Study/Buffalo and a creative associate at Center for the Creative and Performing Arts at SUNY Buffalo. Q: You came to Wesleyan with an interest in experimental music, and now youre also director of the electronic music and recording studios. Tell me about the studio, and what you can produce here. A: There are two studios, a recording booth connected to two large recording studios that double as classrooms and rehearsal spaces and an electronic music studio. 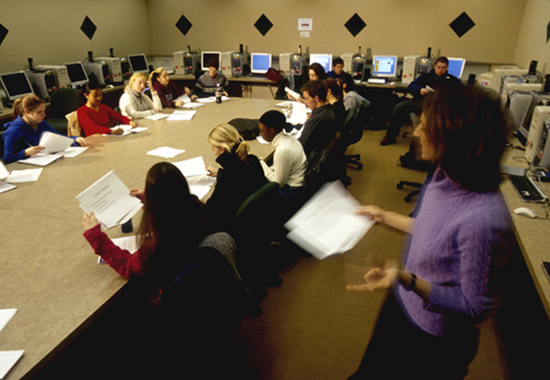 The studios are used for recording and producing student and faculty work. Much of the work we do in the electronic music studio takes the form of interactive systems and live electronics using various kinds of software and hardware. Q: Can you give me a project example? A: A particular focus is SuperCollider, a programming environment for computer music that is now distributed as free software. SuperCollider is being developed by a number of programmers located throughout the world through SourceForge, the largest open source software development site in the world. My own work with SuperCollider has been primarily focused on my own work and making tools that enable students to be able to develop pieces quickly. However, I recently provided a nerdier contribution by optimizing SuperCollider’s primary score library. Q: In addition to your work on SuperCollider, I understand that youre an active composer and scholar? A: This last year I have been doing more work as a scholar and curator. The most recent number of Leonardo Music Journal has an article of mine on the work of the composer and pianist David Tudor together with a CD of his work that I edited. Last spring I curated a group exhibition of sound works at the gallery Art in General in Tribeca. Most recently, a piece I made in collaboration with Ed Tomney was presented in New York City and a piece made while I was a composer in residence at the Center for Contemporary Music at Mills College was presented in Oakland, California. Q: Do you give presentations on your work and music? A: As anyone who knows me will verify, I like to talk. Over the last year, I have given talks and participated in panels at the Getty Research Institute, the art department at Stanford University, the music department at Harvard, the great hall at Cooper Union in New York City and at Columbia University. Q: How would you describe the musically-inclined students at Wesleyan. Where do these students end up working if they stick with a music degree? A: Music students at Wesleyan are an extremely varied group. The only attributes they all seem to share are keen interest and intelligence. 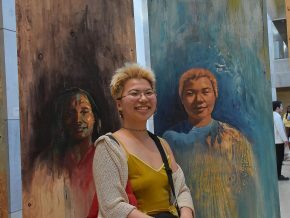 Students of mine have gone to graduate programs at RPI, the Art Institute of Chicago, Cal Arts, Mills College, SUNY Stony Brook, the Baden-Wurttemburg exchange program. Some are teaching, some are in the media industry, some are in the music software industry, some are pursuing careers in Europe and the U.S.
Q: Whats a typical day like for you here in the Music Department? A: Normally, I teach two classes, run a group tutorial and individual thesis tutorials with undergraduate and graduate students. I also organize an annual festival of new and experimental music. One project in last year’s festival involved replacing the light classical muzak that emanates from the parking garage near Main Street with projects developed by students in my class. Q: Outside of work, what do you like to do? Does it involve music? A: Along with music, I love cooking. Many composers are also good cooks! I also enjoy sports such as skiing, hiking, swimming and squash. I am a particularly bad squash player. I do some mountain climbing. Two years ago I climbed the Grand Teton with a friend and a guide. Q: Is your family into music, too? 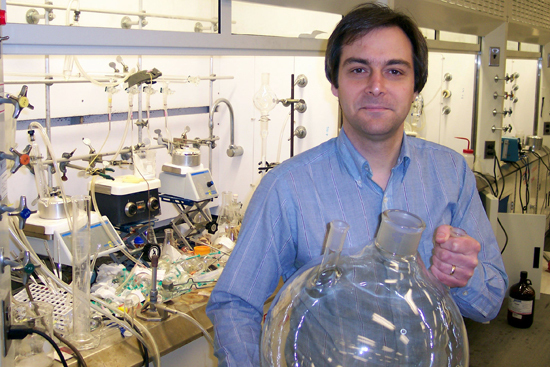 Michael Calter teaches organic chemistry and researches synthetic organic chemistry, which deals with making complex, useful organic molecules from simple starting materials. 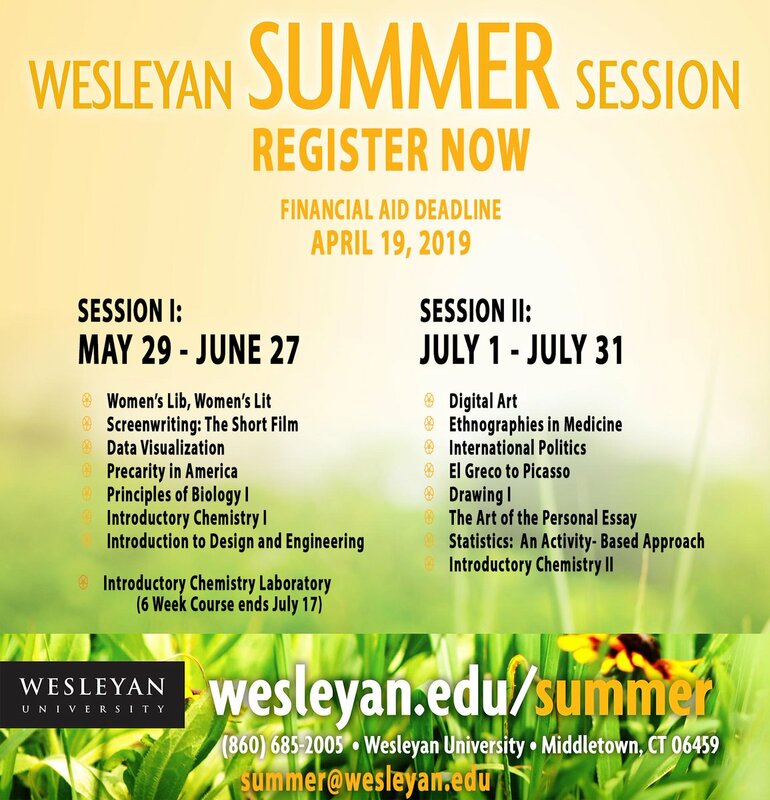 At Wesleyan, Calter teaches organic chemistry and researches synthetic organic chemistry, which deals with making complex, useful organic molecules from simple starting materials. “I’m interested in using the new molecules that my group synthesizes to study biological systems,” Calter said. 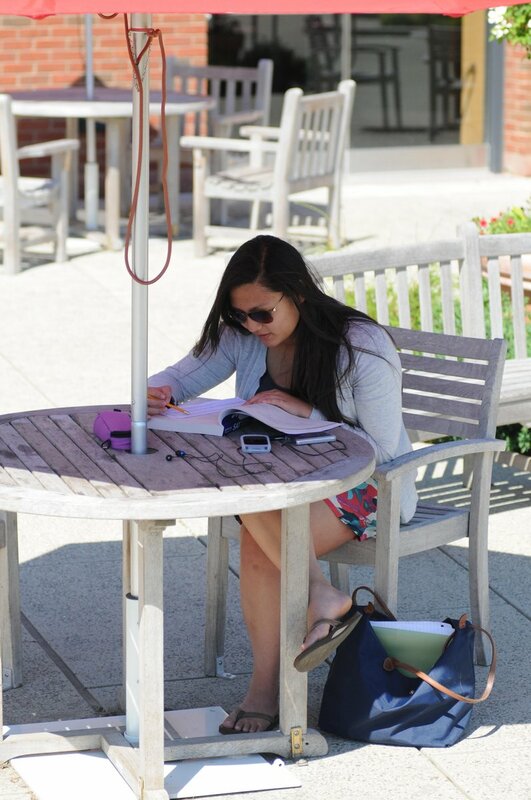 Calter chose Wesleyan based on the institutional commitment to education. “The high faculty to student ratios, the involvement of most undergraduates in cutting edge research, and the rigorous course work required of the graduate students were just some of the manifestations of this commitment that were obvious even during the interviewing process,” he said. “There is also a real feeling of community among the faculty that is lacking at larger institutions.” Calter recently co-authored a paper titled “Catalytic, asymmetric synthesis and diastereoselective aldol reactions of dipropionate equivalents,” published in the “Journal of Organic Chemistry” in 2004. He is currently organizing a symposium for the Chemistry Department that will bring together presentations by representatives from academia and industry. The symposium will be held on May 5. Calter lives in Middletown with is wife, Kimberley and children, Rachel, 12 and Christopher, 9. He has an amateur interest in the history of science, particularly where it intersects with the development of geometry, and the visual arts. Robin Zup, a medical aide with the Health Services Department, is a Certified Medical Assistant and helps students seek medical care off campus. Q: What does it mean to be a medical aide? A: I really do not like the title medical aide. My actual title that I have earned through schooling is a Certified Medical Assistant. I have been trained both in clinical and administrative areas. A: I have many responsibilities here at the health center. Since I really enjoy working with numbers, I have been given the role of handling all of the accounting for all of the students who come into the health center. I also help students who seek additional medical care outside of the Wesleyan campus when needed. Many projects come my way every week. Most say that I am the guru of everything depending on the situation. So yes, I do deal with the students each and everyday. A: It would first have to be my co-workers. They are really like my family. Some of them know me better than I know myself. The second thing would have to be the students. They are great, a lot of fun to deal with on a daily basis. Some of the kids I get to know pretty well. I treat them as if they were my own. Q: Do you have kids of your own? A: I have two really nice kids. My daughter is Kayleigh, and she is 14, and my son is Cody, and he is 13. Q: How would you describe yourself? Your strengths? A: This one is a hard one to answer. I would have to say that I am very much a perfectionist who is very smart with a really great sense of humor. A: I was hired to work part time as a medical aide for 15 hours per week back in September of 1998. Over time I have been given additional hours, now I work 27 hours per week. I work every day, but the hours are scattered. Q: Do you work anywhere else? A: I do have another job outside of Wesleyan. I am a property manager for commercial real estate. I find this job to be therapeutic for me. It is a different type of job and I have different types of people to deal with. I do the work from home. Q: You sound very busy. Do you have time for any hobbies? A: My kids right now are pretty much my full time hobby. When I am not doing for my kids, there are a few things that I do like to do such as read, draw, ceramics or just hang out and do nothing. But most of all, I enjoy traveling. Q: Where do travel? And when do you have time to travel? A: Well, its nice, because I get the summers off, so I like to spend a month in Florida with the kids. We also try to go in April. My parents have a place there, so when we can get there, we go. We dont like to stay at home. Assistant post office manager Jerry Winzer hand sorts mail inside Wesleyan Station. After working 28 years at Middletown’s U.S. Postal Service, Gerard “Jerry” Winzer decided to it was time to retire. Winter, he learned, is not the ideal time to call it quits. To beat the winter blues, Winzer took up a part-time position at Wesleyan Station delivering mail. Part-time evolved into full-time work, and, this year, the assistant post office manager will celebrate 12 years working at Wesleyan, and his 40th year in the postal services profession. Winzer’s workday begins at 7 a.m. when he’s greeted by heaps of unsorted mail. A mail messenger picks up the parcels an hour later to deliver. Lisa Davis, the post office’s manager deals with budgets, equipment and bill paying. That leaves Winzer to oversee 20 student workers, two full-time office clerks and two full-time mail messengers, who each cover a specified route twice a day. They make approximately 80 stops per route, delivering and collecting mail at more than 100 departments. Every letter or publication that comes through Wesleyan Station is hand sorted. With no mail delivery on the weekends, the postal workers have to deal with twice as much mail on Mondays. “You should see it in here on a Monday. It’s crazy,” he says. Campus mail used to be sorted alphabetically, but Winzer has since developed his own sorting system. Now, mail is bundled up inside Wesleyan Station in order of the carriers’ routes. In addition to mail sorting, rerouting letters, managing the staff and working the window, Winzer spends a portion of his day on a postage metering machine. “Three-hundred-thirty-seven thousand,” he says. “That’s how much money Wesleyan has spent on mailing through this machine, since we’ve got this machine. And the machine is going on its third year,” he said, while metering two envelopes from the Psychology Department. Before any letter goes through the metering machine, Winzer types in a department code, to assure proper billing. Each department has its own six-digit code, but Winzer rarely sneaks a peek. He usually types in the codes by memory. “I know a lot of them. I guess they’re just in my subconscious,” he says. His good memory also is put to the test when he meets customers at the transaction counter. The post office has moved to different locations throughout campus. First in the Downey House, and then Fisk Hall, Wesleyan Station now occupies space in the Davenport Campus Center, formerly the John Bell Scott building’s science laboratory. With barely enough room to pass a mail cart through, Winzer is eagerly awaiting the much larger mailroom that will be housed in the Usdan University Center. Construction will begin early this year. According to Alan Rubacha of Construction Services, a mail receiving, sorting, distributing and package handling area in the basement will occupy 1,230 square feet. Another 1,700 square feet of space will accommodate 3,000 post boxes, two transaction counters and additional mail sorting space. The postal workers can use the space. In the 2002-03 academic year, Wesleyan Station received and sorted more than 3.5 million pieces of mail and packages. 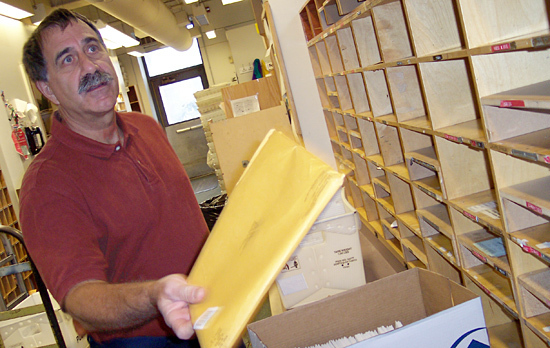 Winzer and his staff handle approximately 8,000 pieces of campus mail every week. The current facility is about 1,000 square feet. But Winzer never minds coming back to work — well, all but one day of the year. 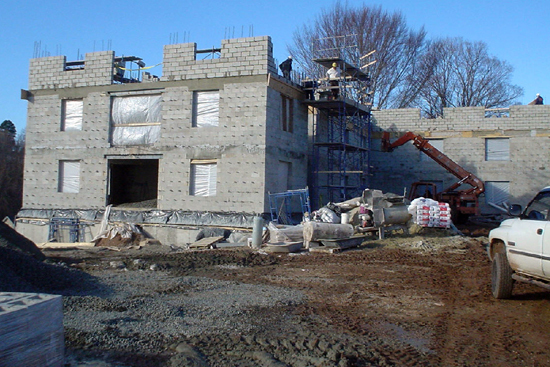 The Fauver Field Residence Complex, due to open in September, will house up to 269 students. This September, when Wesleyan begins its new academic year, students will move into a new living facility: The Fauver Field Residence Complex. 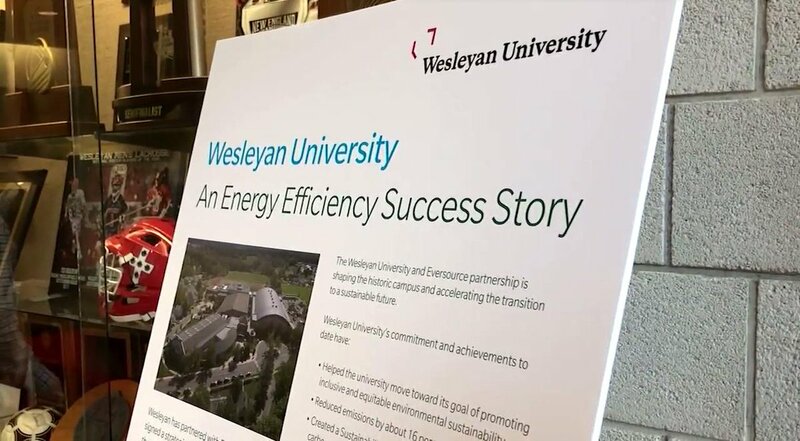 The residences will mark a new step in Wesleyan’s recent history; specifically, the university will be able to accommodate close to 100 percent of its students in university-owned housing. The Fauver Field Residence Complex consists of two buildings that together will house up to 269 students including 165 frosh, which will allow virtually all frosh to live in proximity on Foss Hill. Modern apartments in the complex will house 104 upperclass students and will permit the university to sell the out-of-date In-Town apartment complex. 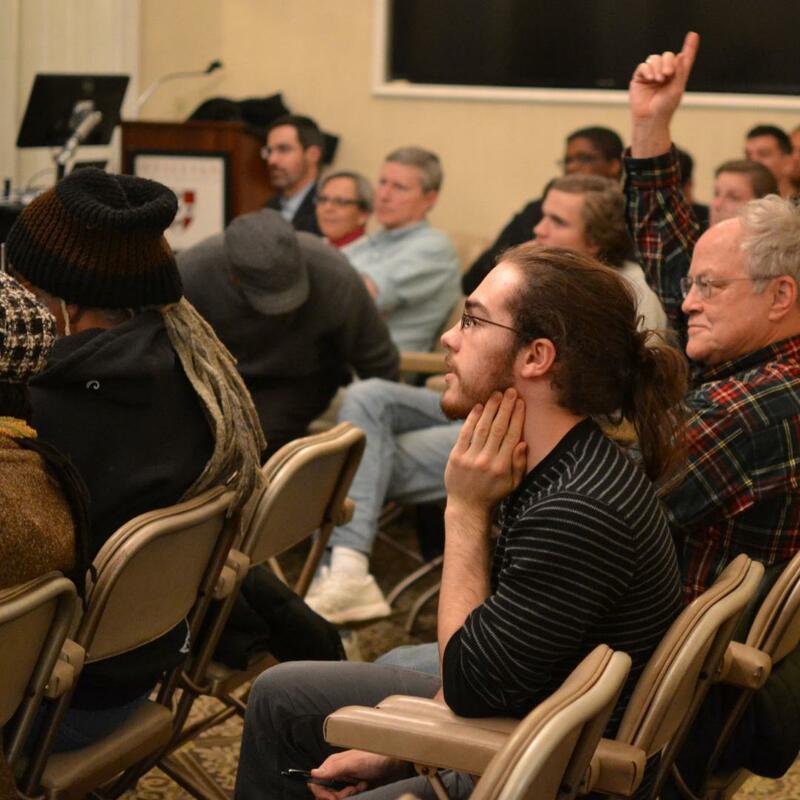 University administrators believe that this will improve student-community relations as well as create opportunities for more families in Middletown to rent or buy the homes that were formerly rented by Wesleyan students. The neighborhood close to the university has become very attractive for homeowners and the university has worked closely with area neighborhood associations to further this process. Are traditional teaching methods keeping pace with the increasingly diverse population of college students nationwide? Or worse are college faculty shying away from balanced teaching or research on race and ethnicity issues altogether because of the incendiary nature of the topics? These are just some of the issues that were discussed at a seminar titled Effective Teaching in Racially Diverse Classrooms, February 28 in the Admission Offices McKelvey Room. The presenter, Franklin A. Tuitt, Ph.D., has done many seminars on the subject of race in the college classroom, as well as extensive research in the subject. This includes a recent stint as a Cabot Postdoctoral Fellow at Harvard Universitys Derek Bok Center for Teaching and Learning where he conducted a study on student evaluations on courses taught by black and white faculty. While at Harvard, Tuitt has also developed instructional resources for teaching effectively in racially diverse college classrooms. He also worked as director of residential life and housing at Wesleyan from 1991 to 1994. Tuitts presentation for Wesleyan faculty will focus on methods for addressing situations that can emerge in racially diverse classrooms, as well as discussing issues that arise when teaching race-related content. There will be opportunity for faculty in attendance to discuss strategies, techniques and case studies related to their own classroom experiences. The presentation is the latest installment of the Race in the Classroom Series that is being offered this academic year by the Center for Faculty Career Development and the Office of Affirmative Action. 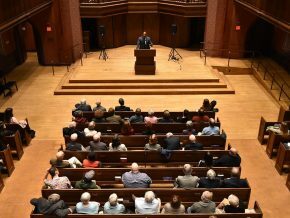 Other presentations have included: Stereotype Threat, presented by Geoffrey Cohen assistant professor of psychology from Yale University and The History of Whiteness, presented by Nell Irvin Painter, Edwards Professor of American History, Princeton University. The presentations have been well attended, although there is always room for more, says Andrew Szegedy-Maszak, professor of classical studies, Jane A. Seney Professor of Greek, and director of the Center for Faculty Career Development. Wesleyan staff will also be attending mandatory specialized diversity training workshops in the coming weeks presented by representatives from the A World of Difference Institute. The training will be called A Campus of Difference and will focus on practical skills to challenge prejudice and discrimination and foster inter-group understanding. “Wesleyan University: In a New Light” is photographed by William Mercer, a 1964 alumnus. The book is for sale at Broad Street Books. Wesleyan as it appears every day, Wesleyan as you remember it, and Wesleyan as you’ve never seen it before. Those are the images and words that fill “Wesleyan University: In a New Light,” a new book produced by University Relations and the Office of Communications. Rich with the colors, activities, and faces that populate the campus, the book features 150 high quality images taken during the 2003-2004 academic year by photographer William Mercer ’64. Mercer specializes in “on location photography” and images for specialty books. His images in this volume provide a fresh perspective to Wesleyan’s grand and familiar landmarks, as well as views on the smaller more intimate events that occur throughout the campus community during an academic year. President Douglas Bennet ’59 wrote the book’s introductory essay while Joseph F. Siry, professor of art, contributed a piece on Wesleyan’s distinctive architecture. Alumni, faculty from the present and past, and current students also provided short, insightful, personal impressions and recollections about the campus and its people. David Low, ’76, associate director of publications, was the book’s editor; Anne Bergen, director of development communications and stewardship was the project manager; Suzy Taraba ’77, the university archivist and head of special collections at Olin Library, served as archival consultant. 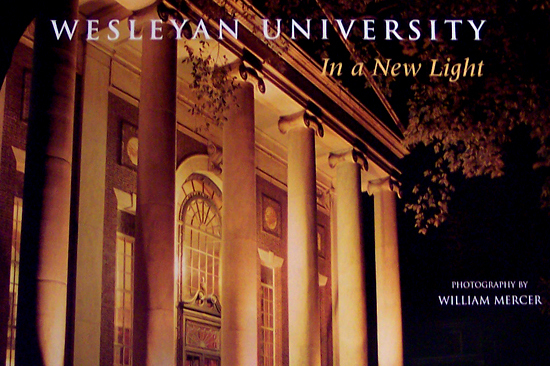 Copies of “Wesleyan University: In a New Light,” are available for $39.95 through Broad Street Books at 860-685-7323 or at www.wes.bkstr.com. Faculty and staff receive a 10 percent discount; departments receive 20 percent off.